Hop cones affected by powdery mildew. Cone development is stunted, and malformations may be evident. Photo by Cynthia M. Ocamb, 1998. Note the white, circular colonies. A new shoot covered with powdery mildew. Flag shoots, such as the one above, are typical in the spring. The white colonies can be difficult to detect. Conidia of the powdery mildew fungus are borne in chains. Photo by Cynthia M. Ocamb, 1999. Cause Powdery mildew is caused by a fungus, Podosphaera macularis (formerly Sphaerotheca humuli), which may persist either as bud infections or as chasmothecia (formerly cleistothecia, sexually produced overwintering structures). Bud infections are the only confirmed overwintering inoculum source in the Pacific Northwest. Although the fungus also is found on strawberry and caneberries, races that attack hop are limited to hop and are not known to infect any other plant species. Once a yard is infected with powdery mildew, the disease usually recurs the following season. Spore movement within the field is the greatest threat for disease spread, but some spread will occur between fields. Symptoms In the spring time, new shoots can be covered with the powdery mildew fungus, and the entire shoot may appear white. These "flagshoots" produce conidia, which initiate secondary infections. Secondary infections on susceptible leaves appear as whitish, powdery spots on either the upper or lower leaf surface. Entire leaf surfaces can be covered with powdery mildew. 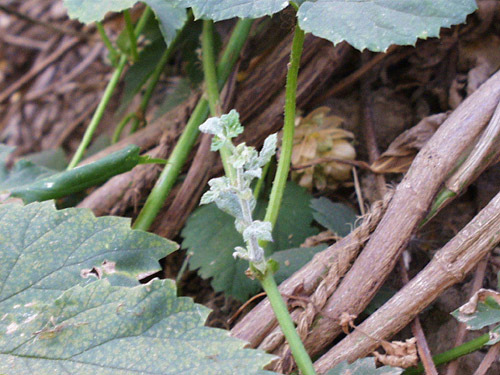 Depending on the hop variety and leaf age, initially a small blister may form before the fungus is visible. 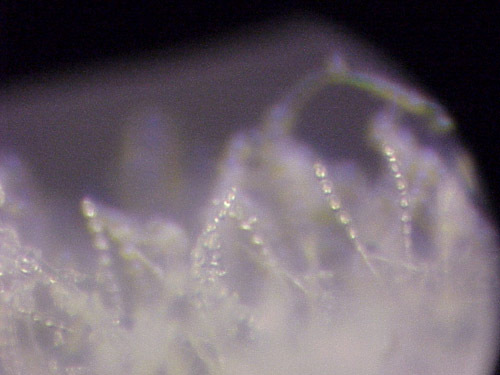 The fungus becomes visible as conidia (spores) are produced, around 5 to 10 days after infection. Younger leaves are most susceptible; as the leaf matures, it is more difficult for infection to occur. Studies have shown that on actively growing shoots, the most susceptible tissues are about five leaves back from the tip. Powdery mildew grows over a wide range of temperatures, at least 54°F to 85°F. Colonies can tolerate temperatures more extreme, especially during high humidity, resuming growth and sporulation when conditions moderate. The exact environmental conditions are not well characterized. Flowers and cones of susceptible varieties may be infected. If a variety is susceptible, cones appear susceptible to infection throughout most of their development. Generally, growth stops in the infected area. Infected cones are stunted, malformed, and mature rapidly, leading to cone shatter and uneven crop maturity. 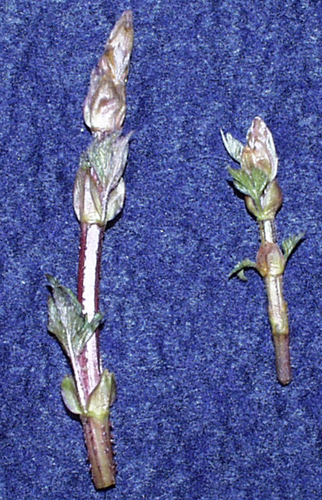 Infections at the burr stage can lead to flower abortion. Powdery mildew usually is visible on infected cones but sometimes can be found under overlapping bracts. Infected areas on cones become red to blackish if chasmothecia are produced. 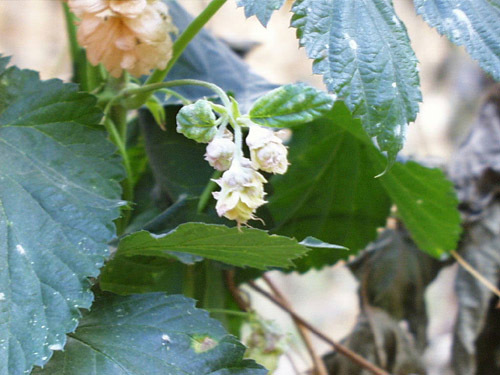 Chasmothecia on hops in the Pacific Northwest have not been confirmed. Cultural control These management strategies aim to reduce overwintering and buildup of early-season disease inoculum. Idle yards should not go untreated! Spores can move between fields, so management timing is important. Reduce or eliminate infected buds and flag shoots by crowning, harrowing, burning, etc. Treating before shoots emerge reduces early-season spread within a field. Completely removing green tissue during preparation for training reduces spore load and subsequent secondary spread. Maintain adequate nitrogen levels but do not over-apply because more succulent tissue is more susceptible. Scout yards regularly for signs of powdery mildew. Control bottom growth after training, mechanically or with burn-back herbicides, etc., in order to reduce active colonies. Strip lower leaves up to about 4 ft in order to break the "green bridge" that facilitates powdery mildew's climb up in the canopy. 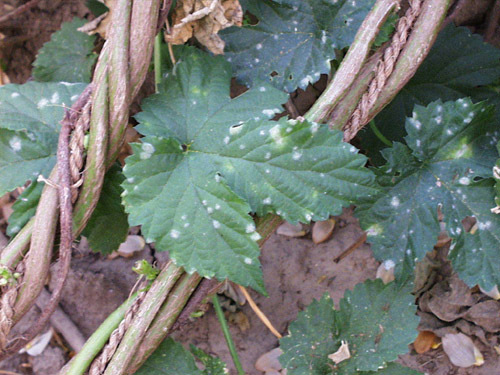 Scout yards regularly for powdery mildew infections. Early harvest can reduce powdery mildew losses in fields with high disease pressure, but reductions in yield and alpha acids may occur if hops are harvested too early. Remove seedlings from around harvesting shed and hop dryer. Protect regrowth against infection or remove shoot regrowth (mow, desiccate, flail, flame, etc.). Chemical control Thorough spray coverage is essential to protect hop plants; spray every row. Apply protective fungicides before disease is reproducing and spreading. Chemical and cultural controls can help to keep disease levels low, both in terms of disease incidence and severity as well as vertical position within the canopy. Discuss your chemical options with your hop buyer; applications during cone development may have some restrictions. Bicarbonates are registered to control powdery mildew. Thorough coverage is essential. Demethylation-inhibiting (DMI) Fungicides (Group 3) are labeled for use. Orius 3.6F at 4 to 8 fl oz/A on 10- to 14-day intervals. Do not apply within 14 days of harvest. 12-hr reentry. Procure 480SC at 12 fl oz/A on 14-day intervals. Do not apply within 7 days of harvest. 12-hr reentry. Rally 40WSP at 2 to 10 oz/A on 5- to 10-day intervals depending on plant growth stage. See label more details. Do not apply within 14 days of harvest. 24-hr reentry. Sonoma 40WSP at 2 to 10 oz/A on 5- to 10-day intervals depending on plant growth stage. See label more details. Do not apply within 14 days of harvest. 24-hr reentry. Tebustar 3.6L at 4 to 8 fl oz/A on 10- to 14-day intervals. Do not apply within 14 days of harvest. 12-hr reentry. Tebuzol 3.6F at 4 to 8 fl oz/A on 10- to 14-day intervals. Do not apply within 14 days of harvest. 12-hr reentry. Topguard Fungicide Specialty Crops at 10 to 14 fl oz/A on 14-day intervals. Do not apply within 7 days of harvest. 12-hr reentry. Luna Experience (Group 7 + 3) at 8 to 17 fl oz/A on 14-day intervals. Do not make more than two (2) applications before alternating with a fungicide that has a different mode of action. Do not apply within 14 days of harvest. 12-hr reentry. Luna Privilege (Group 7) at 3.2 to 6.84 fl oz/A on 14-day intervals. Do not make more than two (2) applications before alternating with a fungicide that has a different mode of action. Do not apply within 7 days of harvest. 12-hr reentry. Luna Sensation (Group 7 + 11) at 3 to 7.6 fl oz/A on 14-day intervals. Do not make more than two (2) applications before alternating with a fungicide that has a different mode of action. Do not apply within 14 days of harvest. 12-hr reentry. Oils are labeled to control hop powdery mildew. Thorough coverage is essential. Cannot be used with or close to sulfur applications. Do not use Omite during or after an oil spray. Do not spray if temperature is below 50°F or above 90°F or when plants are wet or under heat or moisture stress. See label for details. Do not use when foliage is wet as good coverage is essential. 440 Superior Spray Oil at 1 to 5 gal/100 gal water on 7- to 14-day intervals. 12-hr reentry. Quintec (Group 13) at 4 to 8.2 fl oz/A on 10- to 14-day intervals are allowed in OR (SLN OR-180011), WA (SLN WA-180001) and ID (SLN ID-180002). Do not make more than two (2) consecutive applications without alternating to a fungicide with a different mode of action. Do not apply within 21 days of harvest. 12-hr reentry. Strobilurin fungicides (Group 11) are labeled for use. Do not make more than one (1) application of a Group 11 fungicide before alternating to a labeled fungicide with a different mode of action. Flint Extra at 1 to 3.8 fl oz/A in 15 to 200 gal water/A. See label for specific rates and concentrations. Do not apply within 14 days of harvest. Note: 'Concord' grapes are sensitive to Flint and may be injured if accidentally sprayed. 12-hr reentry. Pristine on 10- to 21-day intervals. See supplemental label for specific rates and concentrations. Do not apply more than three (3) times per season or within 14 days of harvest. 12-hr reentry. Sulfur formulations are registered for hop (Kumulus DF O, Microthiol Disperss O, Proganic Micronized Sulfur, etc.). Sulfur is fungitoxic in its vapor phase and, therefore, is effective only when air temperatures promote volatilization. Sulfur volatilizes above 65°F but becomes phytotoxic above 95°F. Using it above 85°F is not recommended. Although sulfur reduces sporulation of established infections, it is primarily a protectant and must be applied before infection. Begin applying when weather conditions are appropriate and continue at weekly intervals. See label for details on rates and reentry intervals. Torino (Group U6) at 6 to 8 fl oz/A on no shorter than 7-day intervals. Do not make more than two (2) applications per year. Preharvest interval is 6 days. 4-hr reentry. Biological control Efficacy unknown in the Pacific Northwest.